The day began in true Into The West Blogger Network style. As I stepped out of my car onto the red carpet which led into the beautiful entrance of The Connacht Hotel. I could hear the chatter of the bloggers who had already arrived inside. I was so excited I thought I was going to burst! I knew it was going to be such a good day. 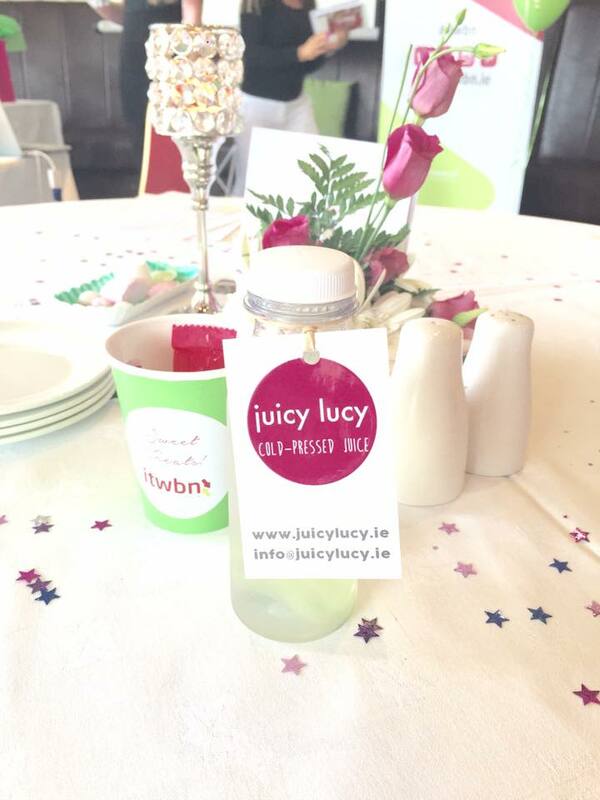 The event kicked off with the most refreshing reception you could have ever imagined by Juicy Lucy. Juicy Lucy is a plant based cold pressed juicing company located in Galway. 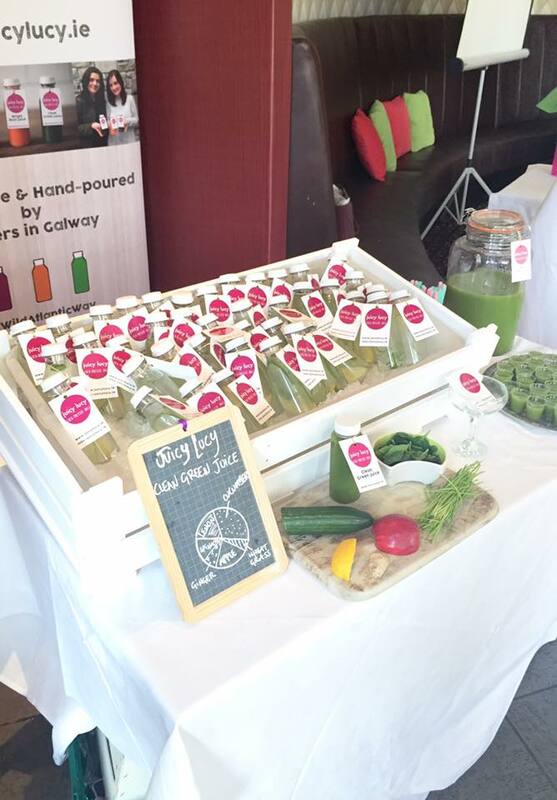 We were lucky enough to sample the Clean Green Juice and Detox Water which was infused with fruit such as lemon, lime and cucumber. They were both delicious. You all know my obsession with juices and smoothies so you can only imagine how happy this made me and I am delighted to let you know that if you live in the Galway area the team do home deliveries so make sure that you check out their website. If you don't live in the Galway area you will be thrilled to know that Juicy Lucy will be soon stocked in super markets. So make sure to follow them on Twitter, Instagram and Facebook for regular updates. During the reception I mingled and networked with other bloggers and had a quick browse of the stands. We then checked out our seating plans, our tables were named after Irish Celebrities which I thought was a really nice touch. One thing for sure is the itwbn girls really know how to make you feel like you have this celebrity status. 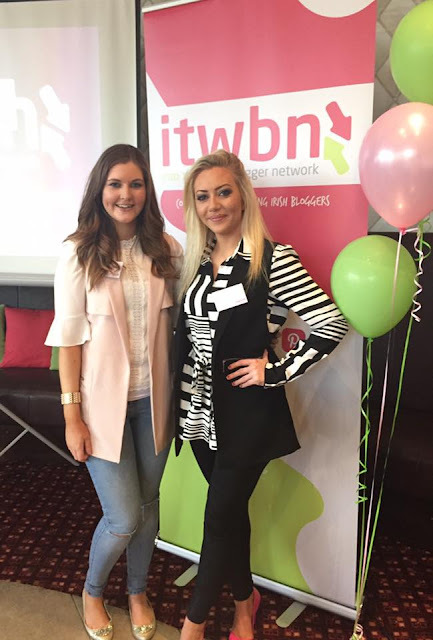 Sinead and Saibh the Founder and Creative Directer of ITWBN kicked off the event with their welcome note and then introduced the speakers, Olivia Collins, Nikki Bradley and Gill Carroll. Olivia Collins was the first speaker of the day. She is the founder of Food PR & Marketing. Olivia told us all about her career and shared with us her knowledge of PR, Marketing and Bloggers. Here are just a few of the tips she shared with us. - Networking is extremely important to get your business publicity both online and offline. Figure out how you can get that offline exposure. 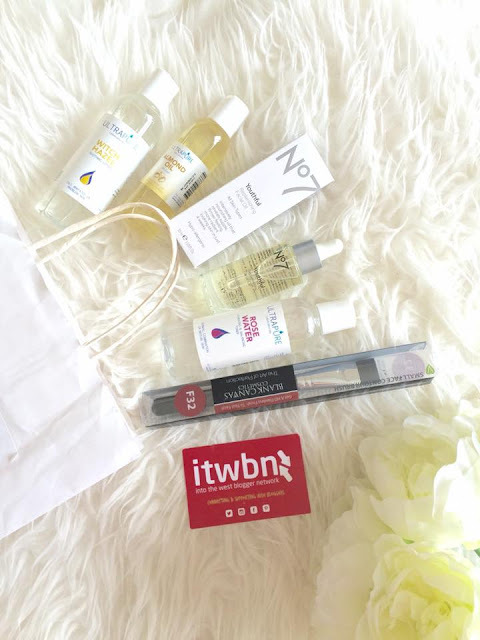 (ITWBN meet ups or events for example). - PR companies want to work with like minded bloggers. - PR companies want speed so don't waste their time. 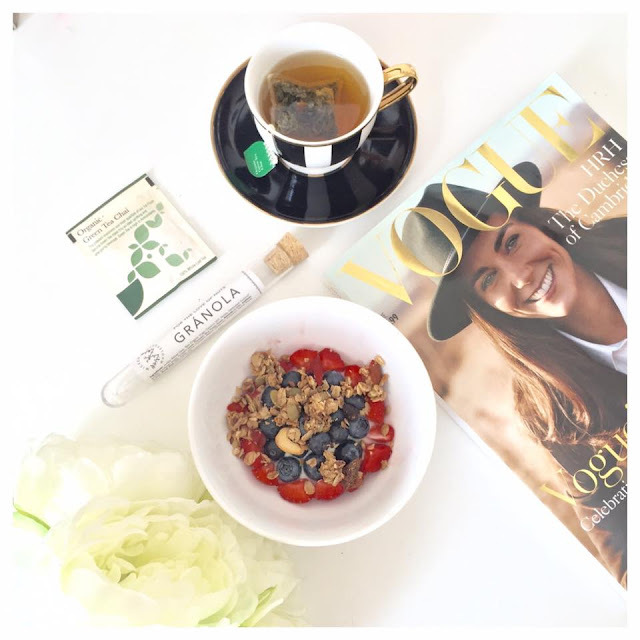 - Treat your blog like a business. - Know the PR companies in your field. - Suggest what you can do for the PR company. - Be an expert in your area. - PR companies don't always focus on your number of followers they want to invest in quality blogs. - Keep up to date with your industry news. Nikki Bradley is a blogger, a journalist, a motivational speaker and most inspirational women for many reasons. Nikki was diagnosed with a rare type of bone cancer - Ewing's Sarcoma at the age of sixteen. She has since gone through many forms of intensive treatment including having two hip replacements before the age of twenty six but Nikki has never let any of this hold her back. After receiving the news that Nikki would have to remain on crutches she set up an awareness campaign - Fighting Fit For Ewings. Nikki's aim for setting up the campaign is to highlight the importance of exercise for rehabilitation, Fitness is used as an educational tool to help people who want to help themselves. Nikki's mantra is 'Yes now, worry later!' Nikki was suffering with chronic pain relying on very strong pain killers daily. Nikki hated this as she is a very health conscious person and worried about the effects the pain killers were causing on her other organs. Nikki decided to take her leg out of the equation and thought about how she could strengthen the rest of her body. After a few months of vigorous exercise Nikki was off all pain killers after ten years. On the tough days when the pain started to come back Nikki went to the gym and worked through it. She learnt so much about herself and found an inner strength that she never knew she had. Nikki is unstoppable! I learnt so much from Nikki today. She really inspired me. She is so incredibly strong in more ways than one. After everything she as been through she still has such a positive attitude and looks at the brighter side of life. She has accomplished so much I could never fit it into one blog post so make sure to check out her blog - Nikki Bradley - Beyond Limits and follow her on Twitter, Instagram and Facebook. You will be so inspired! - You can achieve anything you want to. - Inline yourself with the universe and your entire life will change. - Get rid of all negativity in your life. - How important exercise and fitness really is. - We are selves are the only people who hold ourselves back or push us forward. After Nikki spoke we were served some delicious refreshing Solaris Tea. We were then served yummy nibbles and desserts. 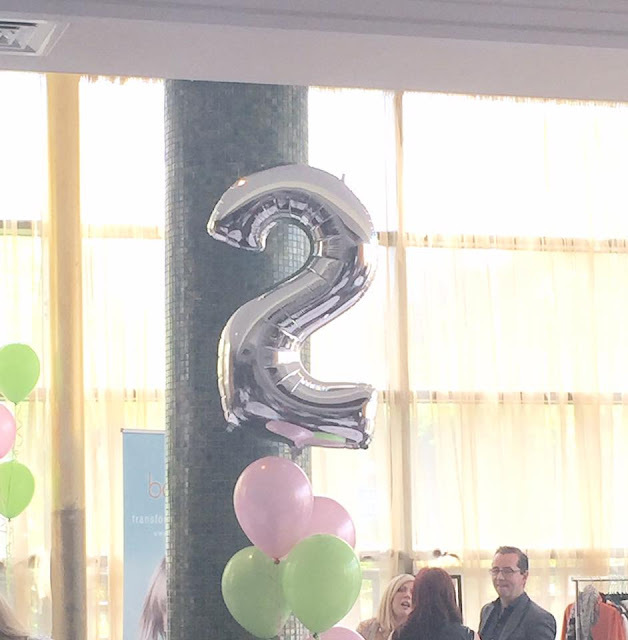 We had blogger chats with everyone at our tables and then had the chance to freshen up and mingle some more browsing the stands such as Siren and Soul , Suzie Mahony Designs , The Cool Bean Company, Bellissimo, LookWest.ie, ClothesPartyU2 and McCambridges. It was then time for the next speaker. Entrepreneur and business owner Gill has proven to be a very successful #GirlBoss in everything she does. Gill owns the infamous cafe's and restaurants 37 West and 56 Central . Gill taught us so much about what it takes to succeed in business and how to be the ultimate #girlboss. Gill is also the founder of the organisation Strive For It which empowers like minded people in business based on the mastermind principles of Mr. Hills Think and Grow Rich. She was also recently awarded Business, Economics and/or Entrepreneurial Accomplishment in the 'Top Outstanding Young Peoples Awards' by JCI Ireland. - No one is going to save you, you have to save yourself. - Set your goals to the highest value. - Know your passion and what sets you on fire. - Push yourself and challenge your self. - Live your true authentic self. - Don't compete with each other, support one another. - Visualize your goals and put them out there. - Make a vision board. - Be the best version of yourself. Next up was the 'Sofa Session' which included some of itwbn's bloggers. 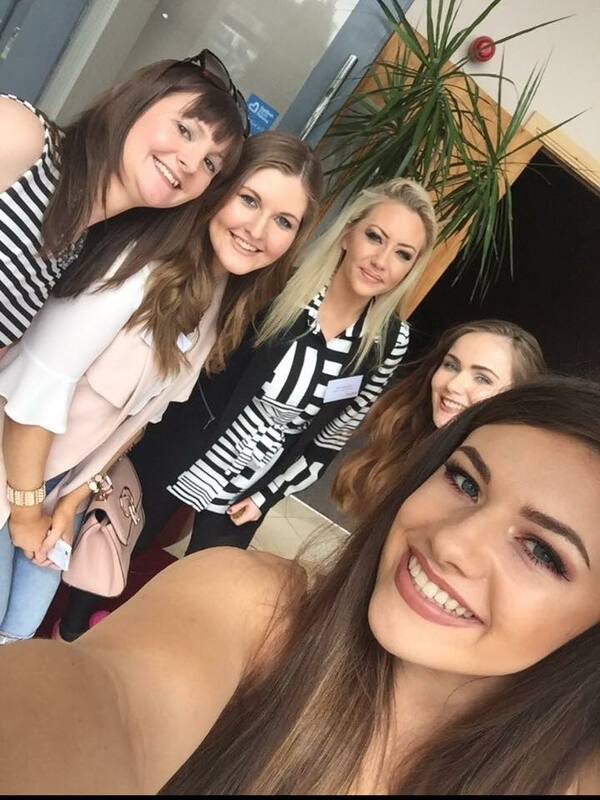 Kieran from Fear Nua Blog, Doug who does marketing for An Pucan along with many other businesses, Dolores from IrishHealthHour, Ciara from Getting Fed up and Serajay from Siren and Soul. Hosted by Kerry from FabuliciousFifty. All bloggers spoke about their favourite social media platform sharing tips for what they find works for them and what they loved most. Doug spoke a little bit about how his video about raising aware for mental health went viral, while Kieran shared his thought's about girls on snapchat and what he loves about twitter. 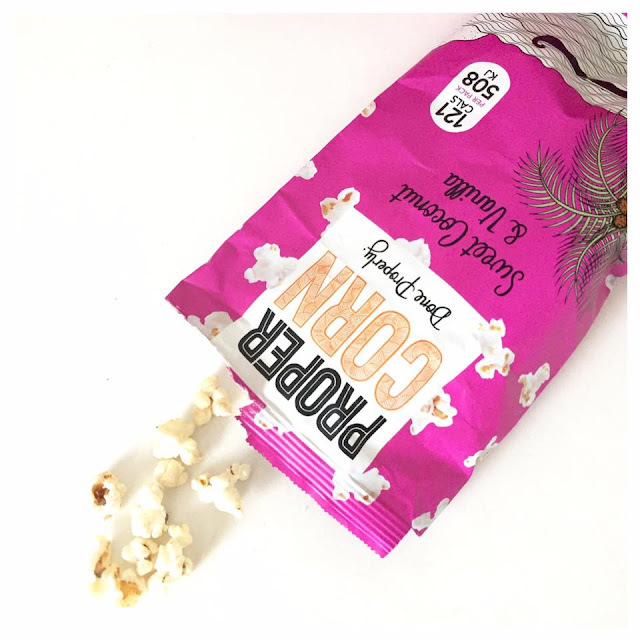 Dolores is also a big fan of twitter and has recently started using blab. Snapchat is Ciara's favourite platform because she loves how real it is while SeraJay prefers instagram because she loves sharing her creative side. 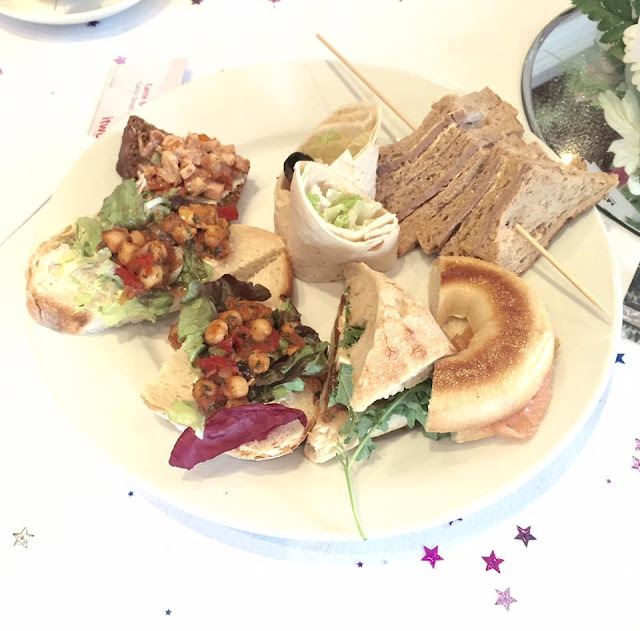 The 'Sofa Session' was really interesting because its a great way to learn from other bloggers and see which they prefer. 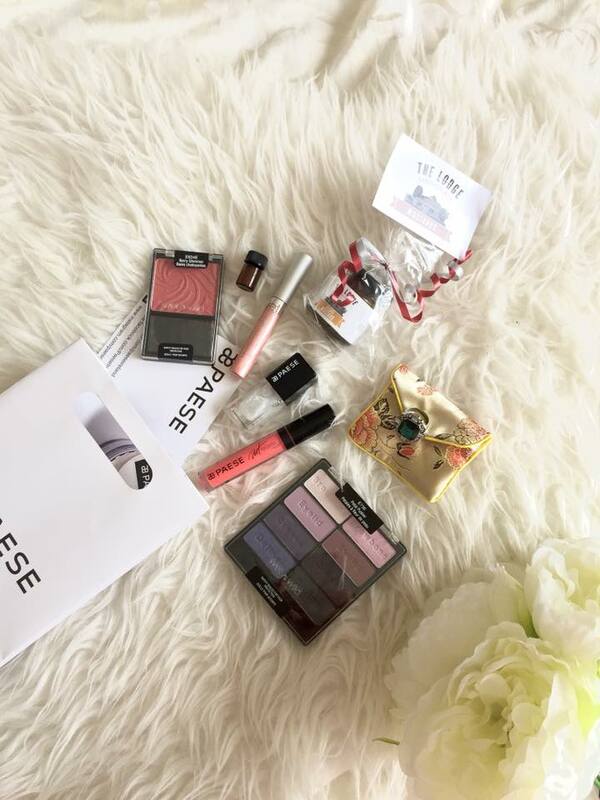 We were also gifted 'Swag Bags' on the day filled with goodies for us to try out. 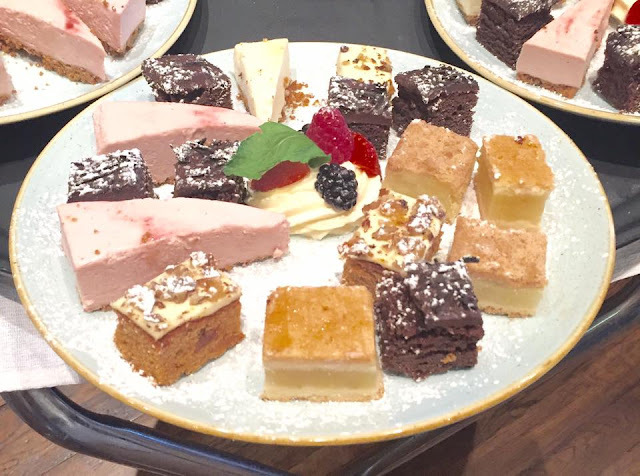 As you can see from the photos we were gifted with No7, Thalgo, The Body Shop, Blank Canvas Cosmetics, Propercorn, UltraPure, Mothercare, Barna Lodge Foods, Dolores Andrew-Gavin, Wicked Wholefoods, WetnWild, Paese Cosmetic and Studio 53. 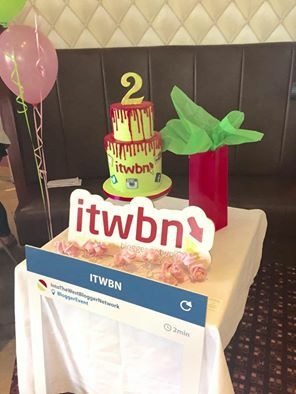 I had such a fun day celebrating itwbn's 2nd Birthday! 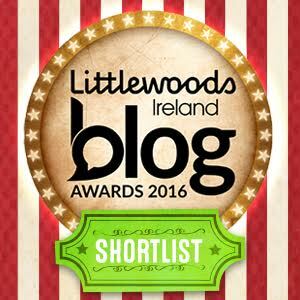 Congratulations to Sinead and Saibh for all you have achieved and a BIG thank you for all that you do for us bloggers! We are all so grateful! I learnt so much today and caught up with some of my favourite bloggers and meet some new ones to add to the collection! I am so excited for the next event so we can do it all over again!